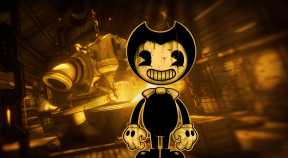 Survive being chased by Bendy. Play the pipe organ 5 times. Get all the Bendys on stage. Choose the way of Bendy. Choose the way of Alice. Play with 25 Bendy dolls. Listen to Henry's audio log. Take a photo at the photo cutout. Complete Chapter 4 with the plunger. Get a perfect score on the Bull's Eye Bonanaza. Find a new way through. Listen to all audio logs in the game. Collect all of the bacon soup in the game. Find all of the hidden radios in the game.